Two pieces of Pepperidge Farms 9 Grain bread. One dollup of Kroger all-natural peanut butter (the kind where the oil separates and you have to stir it). 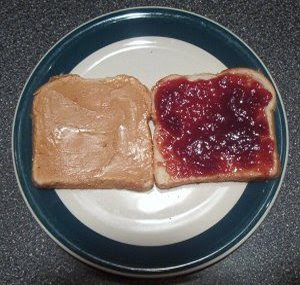 Immediately after removing from the toaster, spread the peanut butter on one piece of the bread. Speed is important so that the peanut butter will partially melt. Spread the jam over the other bread. Put the two halves together. Cut into two halves with the sharpest knife you own. OMG! This is the best recipe ever for PB & J!!!!! Except only southerners can get Kroger peanut Butter!!!!!!! You can substitute Skippy All Natural PB if you want to ....4 stars!